Don't forget that all my classes are available as a "kit to go" option. Check my SU business website for all my events. I am starting a new technique club. 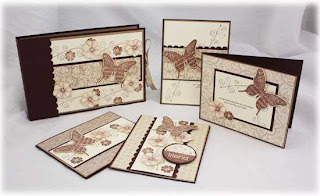 A technique club is a group of 8 crafters that get together once a month at my place and learn new paper crafting techniques in a relaxed and friendly environment. There are couple of spots left - let me know if you would like to join us. This club will be on the second Saturday of every month. 8 months of complimentary classes, one month where you receive Hostess benefits - Level 1 stamp set and $20 shopping spree. All you need to do is commit to purchasing $25 each month in products - that's it! Here is the schedule for the next three months. I will be adding technique classes to this schedule and let you know when I schedule them. Drop ins available for $20. Be ready for any occasion with this office-themed card set. With four co-ordinating cards and a matching folder box, you’ll never be without the right card for the right occasion again! 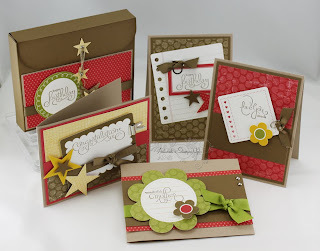 The neutral colors of the Bella Bleu DP combined with the Simple Friendship stamp set give this card set a vintage feel that brings us back to the days when sending hand-written notes to our friends and loved ones was common. 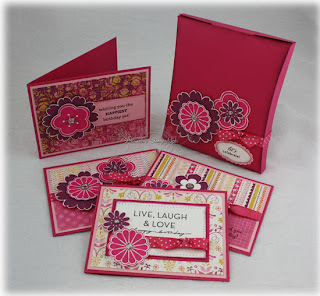 Get inspired to send more cards with this beautiful portfolio and 4 coordinating cards. 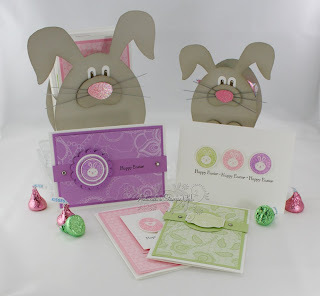 Fun, fresh colors & bright, bold designs make this 4 cards set and one-of-a-kind box the perfect sunny weather project. I am still scheduling my technique classes - one of them will be stamping on candles, the other ones I am still deciding. I will let you know as soon as I know.